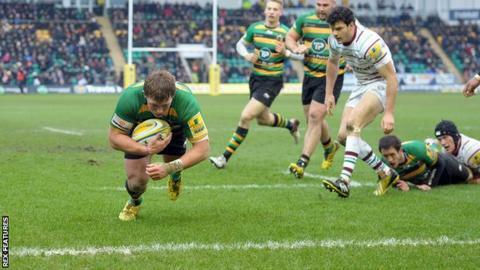 Northampton Saints continued their push for the Premiership play-offs with a five-try win over bottom-of-the-table London Irish at Franklin's Gardens. Scores from James Craig and Alex Waller bookended a penalty try to deliver a comfortable 21-0 half-time lead. After the break Saints upped the tempo, with Lee Dickson setting up Jamie Elliott and scoring one of his own. David Paice scored a late consolation try from close range, but Saints secured their second win in a row. Northampton, who beat fellow play-off hopefuls Harlequins last weekend, have now moved up to fifth in the table, just three points behind third-placed Leicester. London Irish, who are now two points adrift of Worcester in 11th and four points off Newcastle in 10th, opened promisingly but Halani Aulika's yellow card put them on the back foot. Saints' pack seized their early opportunity and tries were the result. Craig finished a textbook driving maul, their power then delivered a penalty try and prop Waller strolled in out wide. London Irish had little discernible opening-half possession but after the break enjoyed a few promising early attacks. However, handling errors thwarted their progress and they could not get off the mark. By contrast, the home side were much more clinical. First, Dickson's chip through set up their bonus-point score, with the TMO deciding that Elliott had gained enough downward pressure on the ball. Then, three minutes later, Dickson finished a slick team score. As the clock ran down the game broke up and Saints' discipline waned. JJ Hanrahan and Jamie Gibson were both given yellow cards and London Irish used the numerical advantage to gain a consolation try, as Paice drove over from close range. "We have a different mindset and a different attitude now. "Over the past two weeks we have shown some sparks. We have put a performance in today and we have played some exciting rugby. "We scored some phenomenal tries today. It is still a work in progress, but we are building some blocks leading to some important games coming up." "I thought the sin-binning of Halani Aulika was the turning point of the game. "They scored a couple of tries off the back of us having a depleted pack. We capitulated and weren't able to gather them back. "Their confidence grew and they finished the half strongly. The game dwindled in the second half but they got what they needed out of the game. "It wasn't a nice finish to the game, but it was out of reach just after half-time I thought. "We need self-belief and that comes from winning. You get winning from confidence in your game and having guys who've done lots of that. "We don't have that, so we need to find other ways of gaining self-belief." Replacements: Ellis, Smallbone, Halavatau, Nagle, Treviranus, Allinson, Brophy Clews, Waldouck.